In the past few years, improvements in materials and techniques have made tooth colored filling materials (composite resin) to be the filling of choice for most American dentists and dental patients. 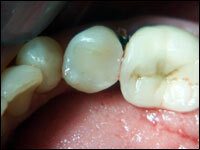 We have used tooth colored fillings for many years with great success. We believe that tooth colored fillings provide our patients with a valuable service with many benefits. Natural appearance: Tooth colored fillings resemble healthy tooth structure. No one will know that you have fillings in your mouth when you talk or laugh. This is not the case with metal restorations. Conserve tooth structure: Tooth colored fillings bond to tooth structure via special primers and adhesives-sort of like "super-glue" for teeth. This allows for less removal of healthy tooth structure than with metal fillings and inlays. Adequate strength: A fillings is indicated if there is enough healthy tooth structure to hold and support the filling under biting forces. If there is not enough tooth structure left, a crown is indicated. 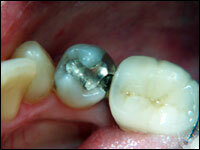 We have found that when used as a filling, composite resin is comparable in strength and durability to silver fillings. Repairable: Over years of use, all fillings show wear and tear. The adhesive properties of composite resin allow for repairs to be made to it without needing total replacement.